This beautiful, three bedroom house has every comfort and upscale amenity you want (including a fabulous OUTDOOR JACUZZI ) for an incredible, unforgettable vacation! (All on one floor and no steps to climb!) Two master bedrooms, each with unbelievably comfortable king-size beds. One bedroom has a comfy Serta I Comfort mattress, and the other is a top line Simmons Exceptionale Beautyrest mattress! (Both mattresses over $2500.!) We own a furniture and mattress store on the island, and pay particular attention to ultimate comfort for the ultimate vacation! The third bedroom has two fabulous twin beds. There is also a beautiful comfy comfy Four Seasons queen sleeper and loveseat in the living room and a big comfy recliner for Dad! Our home is professionally decorated and fully-equipped. It is less than 1/2 a mile from the beach, (easy, short bike ride) Or, only one mile up the road is the brand new renovated Sea Pines Beach Club, with bathroom facilities, parking, food, drink and live music! OR spend the afternoon by your completely private heated pool (extra charge to heat the pool), with tiki bar and jacuzzi! Eating in? We have a well equipped, modern kitchen, large dining room with a view of the pool, or eat out by the pool with the lush tropical setting! There is a deep soaking jacuzzi tub in the second bathroom, in addition to the outdoor jacuzzi! 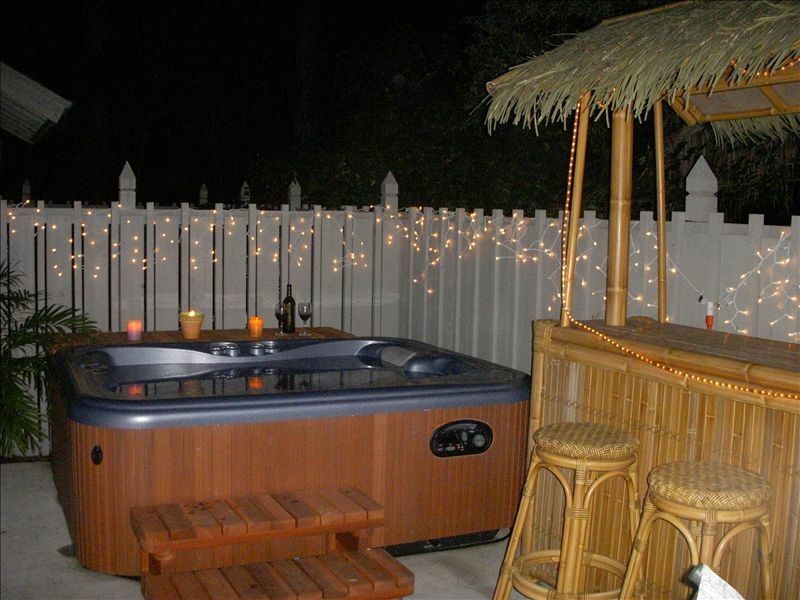 Lots of backyard ambience and fun to be had, whether you are a couple or a couple of friends! OUR RENTALS ARE NORMALLY FROM SATURDAY TO SATURDAY AND AT ALL OTHER TIMES MUST BE OK'D BY US. ALSO, PLEASE DO NOT PUSH THE RESERVE BUTTON UNTIL YOU CONTACT US AND FIND OUT ABOUT PAYMENT OPTIONS. 99% of our renters prefer to pay by check after contacting us (either by email or phone). Scott and I have three grown children, 2 beautiful grandchildren... and love living here in the lowcountry since 1988. We have furniture/bedding stores here locally, and stay on top of design, comfort and quality. We've had rental properties for over 20 years, and that's how we travel, personally. We love staying in homes rather than the sterility of a hotel room. We are very picky in choosing where we stay....so we make sure our rental home is top notch! (Check out our previous guest comments....we get rave reviews! ALWAYS check out previous guest comments before you rent. It tells volumes! Also be sure to check that those comments are current.) We do our best to make our home a five star vacation home, and we love our renters! There is no better beach than Hilton Head, and our little slice of heaven is ideally located, priced excellently, and well....just fabulous! Come visit us! Sea Pines has always been our first choice. It is the essence of Hilton Head, and has everything you want, from great beach, the Forest Preserve with fishing and trail rides, Harbortown and all it's wonderment, casual dining to 5 star dining, and South Beach with live entertainment! There's also the horse stable with petting zoo and tons of bike trails. It's all here! You can park your car and reach everything by bike. Lawton Woods is dead smack in the middle of it all...we love it all! The unique benefits of our own home are many! We have a totally private back yard, that is jungle-like beyond our fence...and inside our fence you have your own private heated pool, with four fabulous lounge chairs, and four chairs and dining table (with umbrella), a tiki bar next to the outdoor jacuzzi, barbecue grill, beach chairs and bikes! Inside, it's all on one floor...no steps to climb. Well layed out, beautifully decorated, and well equipped, with nohing left to chance. If we find a need or want, we fill it! We spend as much time here as we can! Sea Pines resort is a gated community on the ocean, with many amenities available right here. A phone in every room, and free calls to anyplace in the US. Top quality linens and towels. You can even sit by the pool and browse the net! We have an indoor grill, a wok, a slow cooker, baking equipment and if you have any special needs above and beyond, let us know! Top quality kitchen with every amenity you could want! Dining table extends to seat all 8 people. And a flat screen TV in every room, including the kitchen! Flat screened TV's in every bedroom, kitchen and of course the large one in the living room! Lots of board games, cards, puzzles, etc. Many DVD's and video cassettes to choose from. 4 beach bikes provided free. Back yard completely private, with pool, jacuzzi, dining set, top quality lounge chairs, and tiki bar. 4 man jacuzzi (See pictures! )Always heated...no extra charge. Outdoor Tiki Bar, Large high def, flatscreen Cable TV with HBO and DVR which is like TIVO, High speed wireless internet, VCR/DVD, Just Steps to the Beach,(Be sure to double click on previous guests 'comments' and hear what they had to say!) You will have starter rolls of toilet paper, paper towels and a starter packet of dishwasher detergent. So plan on bringing enough to last your family for the week. Or there are 2 major grocery chains right outside of the main Sea Pines gate for all of your shopping needs! Thank you so much for renting out your home! We had never been to Hilton Head before but have now fallen in love with it. We are a family of 8 and loved staying at your house. It was just the right size and had everything we needed, except maybe a toaster (although once we figured out the toaster oven, we quite enjoyed using it). The heated pool was fantastic as was the hot tub. The location of the house was central and easy to get to all the different sites, which were too many to visit in just a week's stay (must stay longer next time). We rode the bikes down to the beach almost every day (not even 5 minutes) and enjoyed exploring the island on the many fabulous bike paths all over the island. What an amazing way to get around! We even rode our bikes to the grocery store which took less then 10 minutes. The Sea Pines area was very private and quiet and we loved the fact that it was a gated, safe community. For having teen kids, this gave them the freedom to bike anywhere on the island without having us with them all the time. They LOVED that. :) The beach was beautiful too! It was wide, smooth, and private down by the nearest boardwalk. We loved riding the bikes up and down the beach too. By far, this is the best beach vacation we've had. Even with having some cooler days, there was still so much to see and do. We will be back! Thank you again!! Thank you Susie, for your wonderful review and taking the time to write it! Much appreciated! And thank you for taking such good care of our home! We would be happy to have you and your family back anytime! Wave runners, Waterslide, Driving Range, Arcades for the kids, all kinds of dining (from fine to fast food), Champion golf courses, tennis courts and fabulous beaches! In fact, the Sea Pines Beach Club has full facilities, including clean restrooms, showers, an outdoor bar and grill, a souvenir shop and nightly entertainment! (They also have daily crafts for the kids on the beach!) In fact, there is a ton of nightly and daily entertainment available right in Sea Pines, or venture out and about on our beautiful island and explore ALL the entertainment! Whew! Did I get it all? What are you waiting for, your dream vacation is waiting for you! We promise you'll be back to our home year after year!